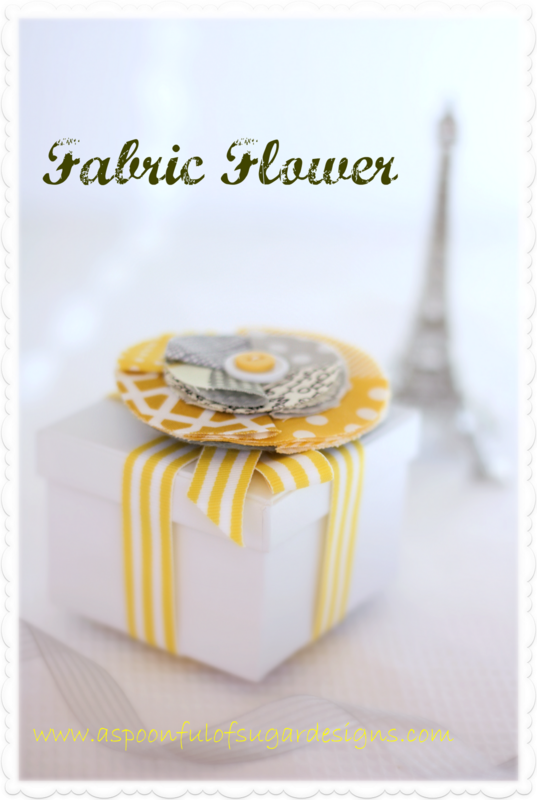 Fabric flowers can be quickly made from small pieces of fabric, and add a special touch to a gift box. If you add a brooch back to the rear side of the flower, it can also be used as a brooch to add some colour to your favourite cardigan or handbag. 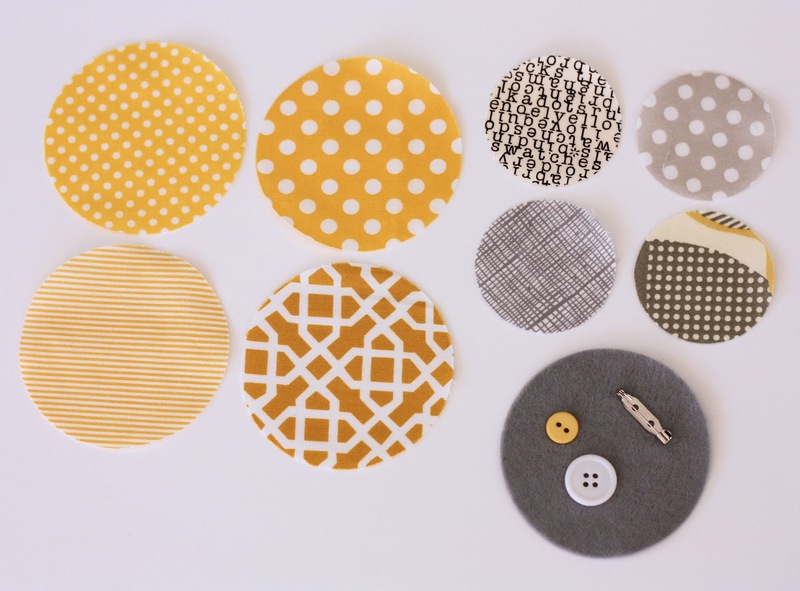 I am really loving the combination of yellow and grey at the moment, so raided my fabric scraps to find four yellow and four grey fabrics. I cut the circles using my Accuquilt Go Cutter with the circle die but they can be easily traced onto the fabric using a compass, and cut to size. Fold the 3 inch fabric circles in half and finger press. 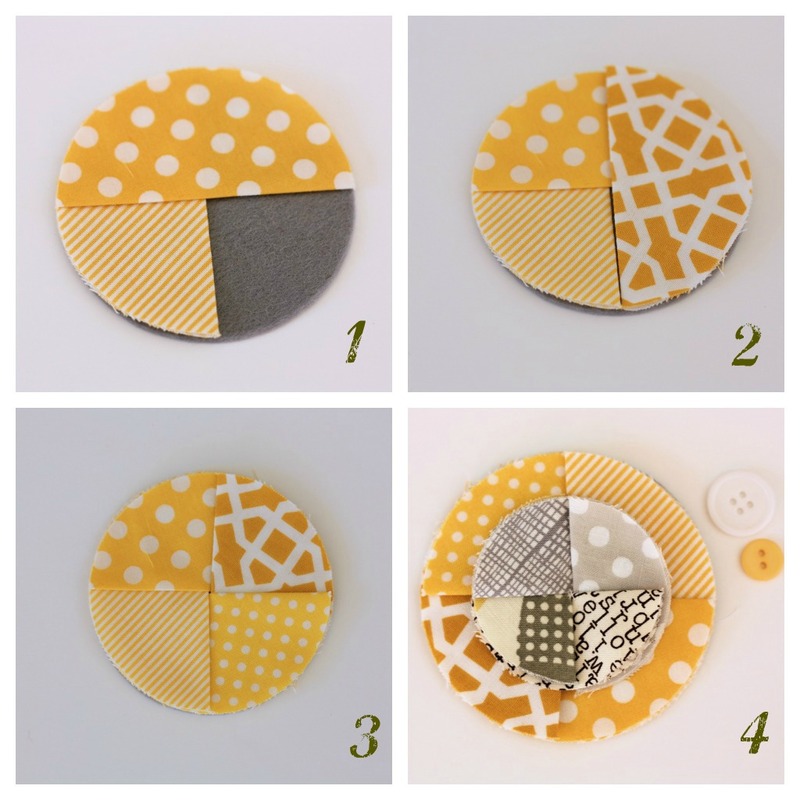 Layer the circles onto the felt so that they overlap (refer to photos below). Stitch the centre of the circles in place onto the felt backing. Repeat for the 2 inch circles and position them on top of the 3 inch circles, and stitch in place at the centre of the flower. Position the buttons on the centre of the flower and stitch in place. Stitch the brooch clasp to the back of the felt. You can add your fabric flowers to a gift; to a scarf; to a handbag; or make a garland of them! They are so versatile and quick to make. Very sweet! The colour combination is very nice. I love this done with different fabrics. I have previously made these flowers with one colour of felt and made them into brooches, have to have a go at them this way. Thanks again for another cute idea for my loved daugther’s birthday, this month 28 :)!!!! 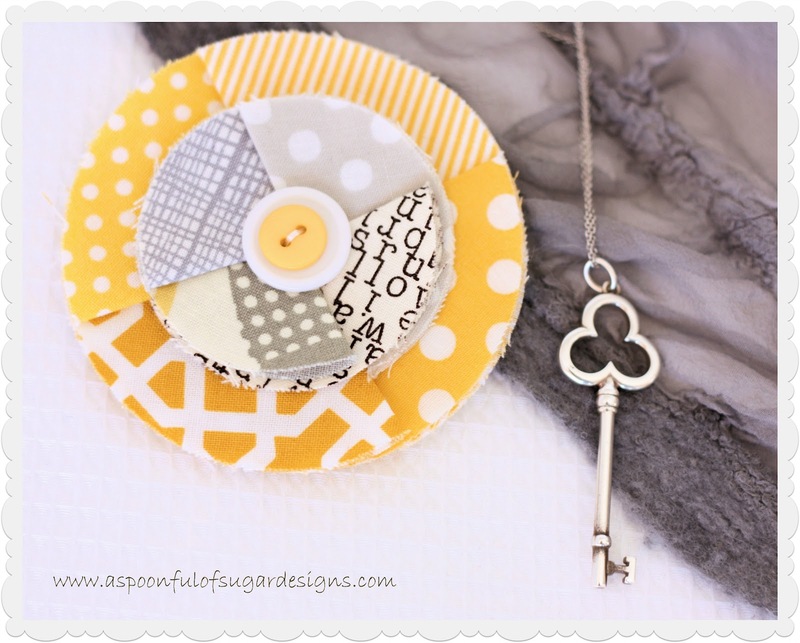 I’m also fan of this yellow and grey combination. That’s such a lovely color combo. Your DIY project is extremely pretty. I hope to give it a try soon. What a great scrap buster, and a lovely way to dress up plain wrapping paper. You could make mini versions for little girl hair clips too. Lovely tutorial, thanks! Oh how nice. Great idea. Absolutely delightful! I love those colours together. Lovely and easy! Thank you for sharing. Beautiful flower project! 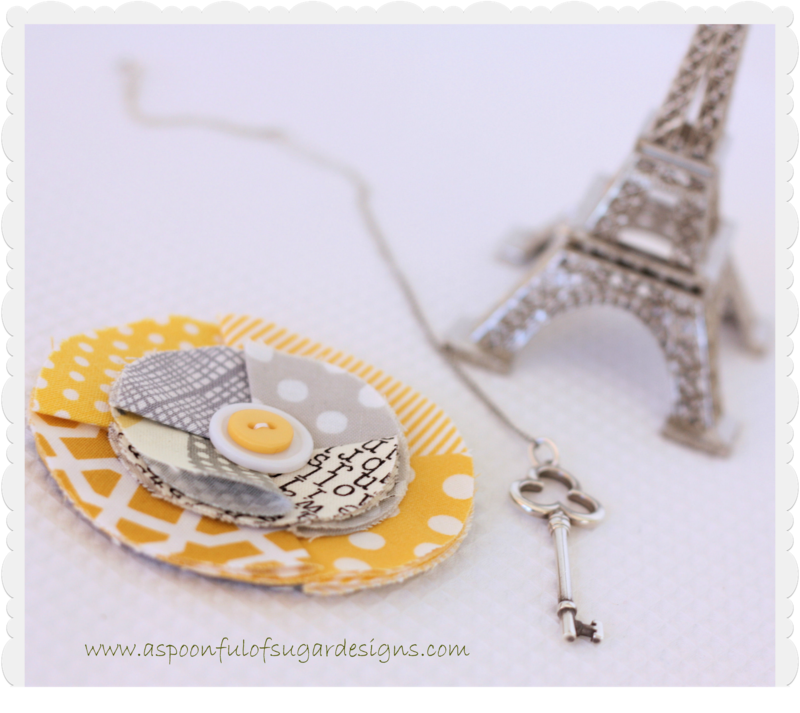 I love all the different ways you can use these to adorn presents, packages, notecards, scrapbook pages, and even as a brooch. 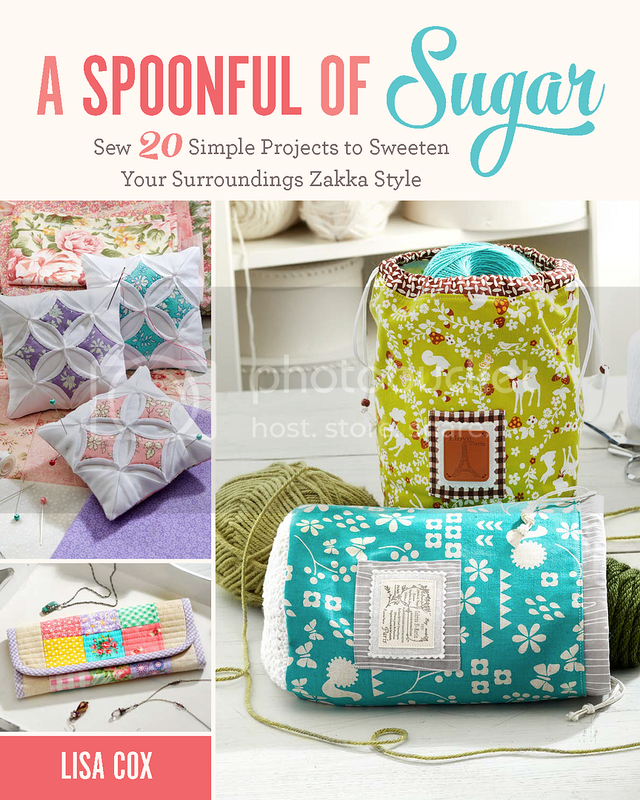 this looks like one of the easiest tutorials i’ve seen and thank you so much for mentioning your Accuquilt Go Cutter. last year when i was planning my wedding, i could have really used one of those but unfortunately online descriptions didn’t really tell me if they could do different sizes as i needed. i still need an easier faster way to cut fabric circles so this has been *very* informative! and talk about cute!!! <3 this!